Small business owners often have even smaller advertising budgets when they first announce their grand openings. Subsequently, the signs that they use to mark the locations of their physical stores should be strategic, distinctive and most of all memorable. When designed and installed properly, store front signs can help business owners to raise awareness about their brands, products or services. In addition to brick and mortar stores, many organizations have websites that inform, sell or do both. Coordinating company brand names, logos and colors to appear both in the virtual marketplace as well as on store fronts that serve the local community is a great promotional opportunity for savvy business owners. Since store front signs are meant to be noticed regularly by large numbers of people, it is critical for business owners to send the right message through professionally-designed and attractive signs. Here are several store front sign considerations that small business owners should ponder before opening their shop doors. Most small business owners are quite passionate about the products and services that they offer to customers, but many of them have trouble conveying the true value of their brands to their target market of clients. Communication issues only become more challenging when business owners have to create abbreviated messages and pictures for signage that should smartly indicate their stores’ purpose. During the business planning process, these entrepreneurs often employ the help of marketing professionals to create the appropriate messages for their storefront signs. Some businesses have the funding to hire professional marketing consultants, but low-cost brand development assistance is available for small business owners through the Service Corps of Retired Executives (SCORE). SCORE has a database of former executives who have extensive experience in nearly all industries. After getting matched to appropriate SCORE mentors in their local areas, small business owners define and document their company visions, missions and strategic goals. These enterprise-level statements ultimately become the primary input for the written and graphical content on storefront signs. Some tips that small business owners are likely get from SCORE mentors who have backgrounds in retail marketing are to keep the text and pictures of their store front signs unambiguous, brief and cordial. An unclear storefrontsign may catch the attention of the truly curious window shopper, but this type of sign is likely to get ignored by the vast majority of consumers who whiz by shopping centers in their cars. A lengthy message on a store front sign is also likely not to be read by potential clients who see the shop from a distance. A company name, an abbreviated phrase and a distinctive picture that is displayed in a positive fashion are often the ingredients for great signage. Small business owners also get advice from their SCORE mentors about location options and proper placement of signs before meeting with custom sign makers. The SCORE business professionals and the organization that they represent recognize the important role that small businesses play in their local communities and within the national economy. As a result, SCORE mentors provide free consultative guidance to business owners throughout the planning and growth phases of their companies’ operations. The internet is teeming with videos that show new business owners how they can design and construct their own store front signs in under 15 minutes. Unless the business owners have academic or professional backgrounds in graphic art, conventional wisdom rules in favor of new business owners employing the services of professional design firms. Trained designers have the creative expertise as well as access to the appropriate facilities, equipment and materials to achieve the desired results for business signs. A store front sign displays the personality of a business, and shop owners should opt for custom designs over templates. A business owner who has crafted the desired message with the help of their SCORE mentor is likely ahead of the curve when it comes to completing a signage project. Those store owners who do not yet have succinct sign messages can often get help from professional designers who nearly always have marketing experience. Accomplished designers want their clients to be happy with the finished results and not just the sketched ideas that are initially presented to them. This work ethic helps to give new customers confidence during signage projects. Professional designers consider color, font, dimension and graphics options that will distinguish their clients’ stores from the rest of the nearby shops. Great designers also make sure that their creations blend in with the architectural features of the surrounding structures. There are many sign making firms that claim to do good work, but discerning small business owners are not satisfied with “good” results; they want exceptional work for signs that create lasting first impressions for their companies. Also, store front signs can be costly from the perspective of the initial financial outlays as well as of the opportunity costs lost due to poorly designed and constructed signs. To avoid bad experiences, store owners check with online consumer review websites like Angie’s List and Yelp to find out what other customers have said about working with specific sign makers. Most custom sign makers are proud of their creations, and store owners can often view portfolios of sign makers’ work to make sure that the designers are capable of producing the type of signs that are appropriate for their company’s needs. Small business owners who are on tight budgets consider partnering with their local college or university art departments to provide promising graphic art students with challenging assignments. In these cases, art professors get to guide and assess students’ skills using real world projects, students build their professional portfolios and shop owners get innovative, custom designs. During the custom sign making process, store owners get educated about the various types of sign designs that are available to them. Store front signs can be made of different materials like wood, metal, and vinyl, and they can be hand crafted or built via machine. Many of these signs are constructed with electronic components for internal LED lights and for digital text and graphics. Sign placement and style types are often chosen based upon stores’ unique offerings, targeted clientele, foot and vehicular traffic patterns as well as building configurations. Many standard store front signs are placed directly on building walls. A wall sign can be anchored front and center on a store, and it usually hangs above the shop’s entry way or main display window. Wall signs can also be mounted parallel to store exterior walls. Some buildings are constructed with space that is especially designed for signs. These spaces are called sign bands, and they are typically located above stores’ front entrances. Mounting raised letters on the exterior face of buildings is another way of creating a wall sign. Buildings that are located in walkable shopping districts often use awnings to provide shade to passersby and to add character to commercial structures. Some types of signs consist of textual content that is applied directly to store awnings which are usually located directly in front of stores. Most store awnings are already properly centered, and this helps to eliminate incorrect sizing and placement errors that could happen during sign installation. Sign lettering and graphics are commonly displayed on store awnings’ faces or valances. Some shop keepers who want to attract pedestrian and vehicular traffic that approach from their shops’ sides can use awnings’ side panels to display their company names, logos or brief branding messages. A type of sign that is often seen used by different establishments like small diners and shoe repair shops is the window sign. Windows signs are letters and stenciled graphics that are directly affixed to shop windows. Most of the time these types of window signs utilize vinyl decals that adhere to window surfaces either permanently or semi-permanently. Other types of window signs display content at store windows via hanging panels of poster board or synthetic fabrics that are located inside the store. A positive aspect of these types of window signs is the signs’ ability to somewhat block unwanted heat and damaging ultraviolet (UV) light that stream through store front windows that get direct sunlight. Alternately, the same signs that provide shade to the store are also the ones that inhibit viewing by potential customers who walk past the establishment. Marquee signs are special types of displays that are mounted above the entrances of dinner theaters, cinemas and play houses. These signs feature canopies that display detailed information about organizations or the special events that they sponsor. The signs’ content, which usually indicates show names, dates, and times, can be found on the front sides of canopies. Other types of marquee signs are hung perpendicular to buildings’ exterior walls, and their messages can be seen by people who approach the buildings from either side. Marquee signs are also used by store front churches that are sometimes located in cities. Urban planners work hard to make sure that communities attract businesses that improve the quality of life of residents and contribute to economic growth. The results of their research and planning for community development are often used as expert input when city officials draft commercial regulations and ordinances. These ordinances are meant to promote the prosperity of all businesses within specific areas, ensure the safety and general enjoyment of the people who visit commercial establishments and avoid unnecessary damage to the natural environment. 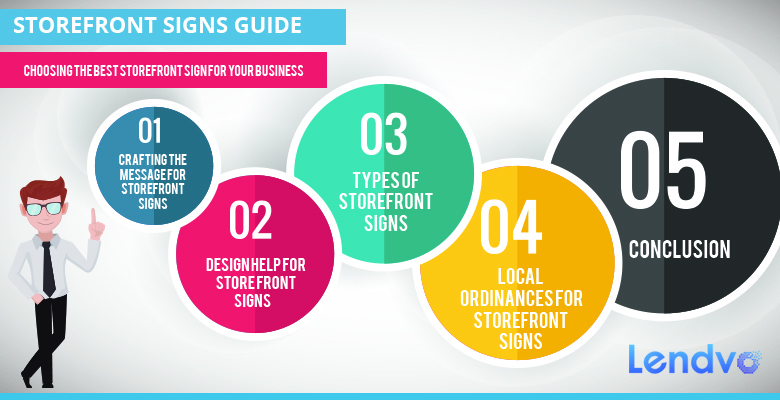 Business owners should review the rules relating to store front signage at their local city planning or zoning offices before meeting with custom sign makers. Ordinances relating to store front signs vary by region. Many neighborhood leaders encourage small business owners to be as creative and unique as possible when it comes to signage because they believe that store front variety draws more traffic into shopping areas. Other community officials, who work in historic districts, encourage distinctive graphic designs, but they enforce special rules that help to ensure that store front signs do not detract from the area’s traditional character. Business owners, who have stores that are located in the District of Columbia’s (D.C.) colonial-era communities, are discouraged from using window signs that block visibility into store front window display areas. Some of these buildings have transom windows that are located above main store front windows and doors, and local ordinances restrict the use of awning signs that store owners might mount above the transom windows. Other commercial regulations in D.C. were adopted to prevent shop keepers from installing signs above building roofs, painting signs directly upon building exterior surfaces, putting up signs that obscure architectural details of structures and placing too many signs on store fronts. The city of Milwaukee requires shop keepers to obtain city permits prior to installing store front signs. Some of their sign-related regulations include restricting the size of store front signs, banning signs that are made of impermanent materials and limiting the length of time that store owners are allowed to display temporary signs in stores. Milwaukee shop keepers who do not comply with city ordinances regarding store front signs face stiff monetary penalties. No store sign lasts forever, and there are times when it makes financial sense for store owners to consider investing in new store front signs. When replacing signage, shop owners have opportunities to both refresh the curb appeal of their stores as well as practice good environmental stewardship. Instead of hauling away old signs to city landfills, store owners can donate unwanted signage to organizations, businesses or individual artists who recycle them to create custom signs for all types of businesses. Which is Better – Square or PayPal? Nextiva Reviews Explained: Is It the Right VoIP System for Your Business? Is Credit Karma Accurate or a Waste of Time? Can I get a Business Loan Without Collateral? Is Credit Karma The Real Deal? Do You Need a High-Risk Merchant Account? Launching a Business on a “Quirky” Domain Name? Think Twice! What Is An E-Commerce Business? Looking To Buy A Website And Domain? Lendvo provides financial services to web business by automatically leveraging their unique data, traffic and assets to originate business loans serving the digital business community.